I have a very power hungry desktop computer for HTPC and a server for large file storage. When I’m travelling with my laptop, I obviously can’t carry all my files and data with me, so I occasionally use “remote desktop” to access my desktop from the road. I also use a Plex Media Server to stream content from my server. However, the computer has to be on for me to be able to do this. This means I need to leave the computer on all the time, just in case I need to access it. This wastes power, costs me money, and harms the environment. My Raspberry Pi, on the other hand, consumes a minuscule amount of power, and is always on anyways, serving other purposes. Once you’ve received confirmation that the computer is alive, you can access it as you normally would, depending on what you’re doing (via SSH, FTP, or Windows Remote Desktop, for example). Remote Computer: This is the “power-hungry” computer located on the same network as your Raspberry Pi. I’m assuming you are using a hardwired Ethernet connection, since Wake-On-LAN (WOL) does not work over Wi-Fi. WOL Sever (Raspberry Pi): This is the low-power, always-on, micro server that will be running on the same network as the remote computer. You don’t have to use a Raspberry Pi; any low-power platform capable of serving up web pages, running PHP, and sending Wake-On-LAN magic packets will work fine. Client: This is the computer, phone, or other web-connected device that will view the WOL control webpage. Router: I assume you are using a home router with a fairly standard feature set, and that you have administrative access to it. It should support DHCP address reservations, NAT port forwarding, and ideally support for a dynamic DNS updating service (like DynDNS or NoIP). Dynamic DNS Service: This is a service that handles redirecting a URL to your home’s dynamic IP address. Since most ISPs assign dynamic WAN IP addresses, you need to use a service like this to ensure you can maintain access to your home network, even when the externally-facing IP address changes. 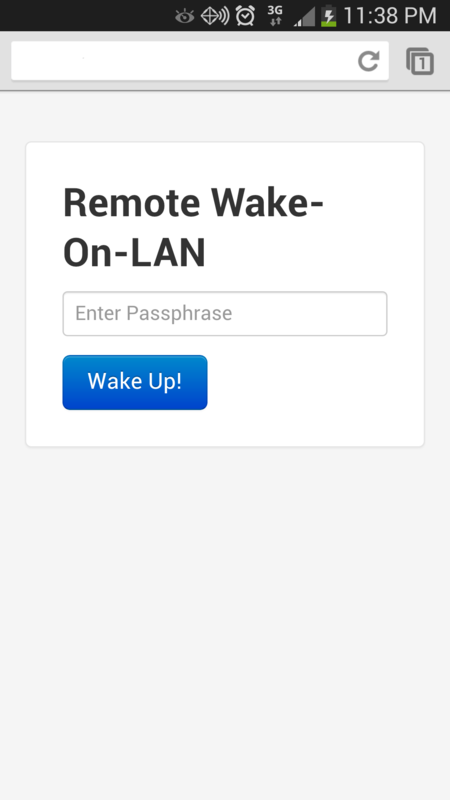 Ensure that the remote computer supports Wake-On-Lan (WOL) functionality. You may need to boot into the BIOS and permit the computer to be woken up via the network interface. This will look different on nearly every BIOS. LifeHacker has a good tutorial showing how to enable WOL functionality. For a shortened version specifically for this tutorial go here. Setup your Raspberry Pi with a linux distribution if you haven’t already, and get it connected to your network. Adafruit has a great set of tutorials that can help you do the initial setup for your Raspberry Pi. I made a condensed version on one webpage here. (Note: some instructions are for older version but I was able to find my way through everything ). Next, find the port forwarding configuration screen in your router’s administration panel. You’ll want to route HTTP data to the raspberry pi, and any remote service ports that you want to access to the remote computer. Importantly, many ISPs will block incoming traffic on port 80, the default HTTP port, to prevent customers from hosting websites from their residences. But, you’re smarter than they are! Simply route an arbitrary external port, to the internal port 80 on your Raspberry Pi. In the screenshot below, you can see that I am routing external port 5000 to internal port 80. This means that when you eventually access the WOL server, you’ll need to specify the port, like this: . Route the appropriate port for whatever services you want to access on the remote computer. In the screenshot below, I’ve routed port 3389, which is what Window’s uses for Remote Desktop. If you wanted to access an SSH server or SFTP server running on the remote computer, you could additionally route port 22. You can find a listing of ports used by various services on wikipedia. Next, you’ll want to sign up for a dynamic DNS updating service that your router supports. Different routers support different services and most likely will require DDWRT installed to configure. If you have an Apple Airport Extreme or Time Capsule then this is not an option. That is why I chose to create this tutorial since I got rid of my router with DDWRT. Follow my guide here if you want to also use your raspberry pi to configure and autoupdate your DynDNS. Sign up for a free account, and get a URL that looks something like this: yoursite.no-ip.org. NoIP even supports port 80 redirects, so you can configure your account to not require appending the non-standard port number to the end as described in the last step. Once you’ve got your dynamic DNS account, find the Dynamic DNS (DDNS) updating screen in your router’s administration panel, and enter your account info. Now, you’ll always be able to access your home network, without knowing the IP addresses, and the router will handle automatically updating where the URL directs when your dynamic IP changes! Follow the instructions in the file to set your passphrase hash, the local IP/MAC for the computer to wake up, and the ping retry value. When you’re done, save and close the file. Notes for the config.php file. You can add as many computers to the list that you want. For some reason to work with mine I had to included a space after mac address and ip address for it to work. If the remote computer is Windows 8, you will need to change some settings to make it reply to ping requests (or else you won’t know when it has woken up). By default, Window 8 does not reply to pings. Follow these instructionsto make it reply. 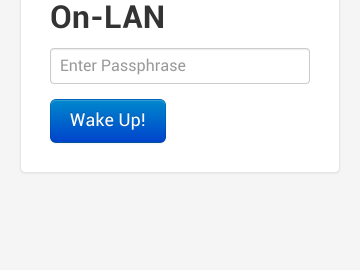 Download the Sleep on LAN software and run it on your windows computer. Set it to launch at boot so that it will always be ready to go. 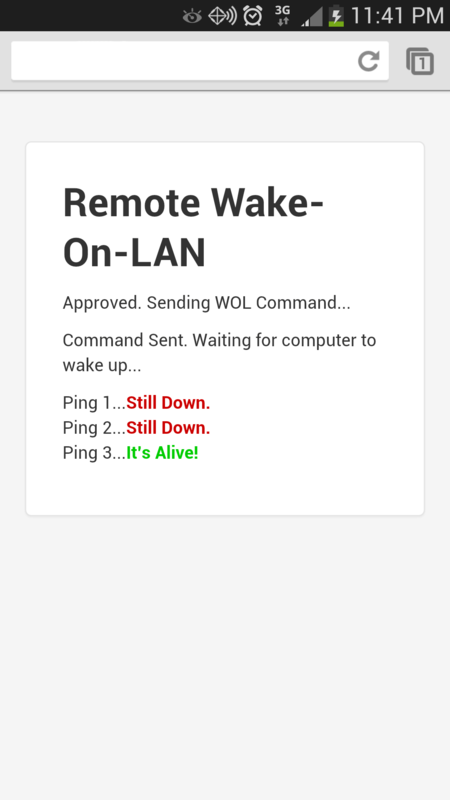 Note, with this updated version of the webapp, it will now ping the computer to check if it’s awake or not to decide if it should present you with a “Wake Up” or “Put to Sleep” button on the interface. The app now includes a dropdown that allows you to pick a computer. The config file has been updated to include lists for computer names, IP addresses, and MAC addresses. You can now Wake/Sleep as many computers as you want! Thanks to GitHub user ahodgey for submitting a Pull Request with most of this functionality (I made some updates to his pull request, and merged it into the master repository branch). You’re done! Put the computer to sleep, visit the dynamic URL that you chose, and you should be presented with the screen that was shown earlier in the tutorial. When you input your passphrase, it will be compared with the hash by the PHP script. If it is approved, the Raspberry Pi will send a command to the remote machine to wake it up. The display will update in real time to show you when the machine has woken up and successfully joined the network. You can then access it using any program whose ports you’ve forwarded. Enjoy!